This year, Pastry Chef Benjamin Siwek’s handcrafted log cakes are inspired by the four cardinal points (North, South, East and West), and incorporate classic flavours and flora elements of each region. The North log cake is perfect for those dreaming of a white Christmas. Reminiscent of scenic snowscapes in the Northern Hemisphere, this visually captivating log cake is a combination of chestnut biscuit, berry croustillant and blackcurrant jelly. Savour a taste of tropical paradise with the vividly striking South log cake which is comprised of coconut biscuit, passion fruit croustillant, mango jelly and caramelised white chocolate ganache. Those seeking a more unconventional log cake flavour will be intrigued by the oriental inspired East log cake, which features candied kumquat biscuit, mandarin jelly, red oolong tea and dark chocolate ganache. Meanwhile, the perfect combination of pistachio biscuit and croustillant, strawberry jelly and white chocolate ganache in the West log cake will surely delight palates. 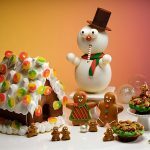 Perfect for gifting, the extensive selection of festive goodies at Colony Bakery include the classic Gingerbread House, White Chocolate Snowman, signature Upper Crust and an assortment of festive hampers, while our takeaway roasts and dinners will facilitate fuss free festive celebrations with family and friends. Please refer to Annex A for the Festive Gourmet Shoppe List. Guests who are celebrating the holiday season with us can add extra meaning to the festivities by making a donation towards the “Tree of Wishes” in our hotel lobby. For as little as $10, grant a life-changing wish for a terminally ill child. Simply pick up a Nutcracker ornament from the “Tree of Wishes” and approach any of our Ladies and Gentlemen at the Front Desk for assistance in processing your donation. All proceeds go towards the Make-A-Wish Foundation Singapore as part of the hotel’s Community Footprints initiative. Soak up the festive cheer at our annual Christmas family brunch extravaganzam which includes a ‘live’ band, a photo booth, kiddy rides, carnival games, a bouncy castle, and even a guest appearance by Santa Claus! Gastronomic highlights include Christmas turkey with traditional stuffing, cranberries and giblet sauce; glazed gammon ham with candied ginger; and a range of festive desserts, Christmas stollen and panettone. *Prices include unlimited pours of soft drinks and fruit juices. Bid adieu to 2018 and join us as we usher in 2019 with a lavish New Year’s Eve meal at Colony. Look forward to highlights including Ossetra caviar with blini; Boston lobster a la plancha; flambe foie gras; and wagyu beef Rossini. At the stroke of midnight, catch the dazzling fireworks light up the sky over Marina Bay from the hotel lobby, before adjourning to Chihuly Lounge to dance the night away while a DJ spins ‘live’ beats until 2 a.m.
*Prices include unlimited pours of soft drinks, fruit flavoured sparkling mineral water and fruit juices. Table reservations are available from $400, and are subject to availability. Pre-payment is required. 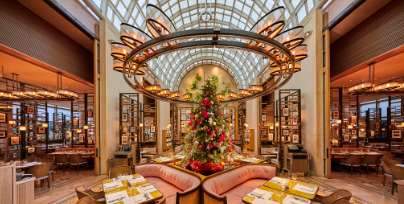 This festive season, enjoy a convivial gathering with loved ones and savour the good times over epicurean delights at Colony, the One Michelin Star Summer Pavilion, or Chihuly Lounge. Festive-themed lunch, dinner and vintage Champagne Sunday brunch are available from 25 November 2018. For more information, please visitwww.colony.com.sg. 12 p.m. to 2.30 p.m.
Savour a true taste of Singapore showcased at seven ‘live’ stations alongside festive highlights such as honey-glazed gammon ham with caramelised pineapple; grilled butterfly tiger prawn with roma relish; and slow-baked tomahawk with roasted potato and charred capsicum. *Prices include unlimited pours of fruit juices. 7 p.m. to 10.30 p.m.
Indulge in a selection of freshly-shucked oysters; Alaskan king crabs; and other cold seafood delights alongside festive dishes such as the roasted rack of lamb with a pomegranate glaze; wagyu beef wellington; and truffle potato mousseline. ^Prices include unlimited pours of soft drinks and fruit juices, and a glass of festive mocktail. Journey through Singapore’s heritage cuisines at seven different conservatory kitchens showcasing festive highlights such as the slow-baked wagyu whole leg with Yorkshire pudding; sous vide pork belly with gherkin, cranberry and onion marmalade; and baked halibut with zucchini mousse and parsnip crisp. Christmas carollers and guest appearances by Santa Claus will provide ‘live’ entertainment during both seatings. First Seating: 10.45 a.m. to 1 p.m.
Indulge in a gastronomic odyssey with loved ones on Christmas with highlights that include oven-baked turkey with chestnut stuffing and rum-infused otome apple; Bostin lobster a la plancha with chardonnay nage; and pumpkin ravioli with parsnip cream and chorizo. ^Prices include unlimited pours of fruit juices and a glass of festive mocktail. Kickstart the new year with a hearty Champagne brunch at Colony, comprised of a scrumptious menu that includes lobster eggs benedict with butter brioche; baked halibut with herb crumb and orange mayonnaise; half shell scallop with Mentaiko remoulade; and foie gras flambé with kirsch-infused Morello cherry and ginger crumble. ^Prices include unlimited pours of fruit juices, and a glass of festive mocktail. For dining enquiries or reservations, please call 65.6434.5288 or email rc.sinrz.restaurantreservations@ritzcarlton.com. All prices listed are in Singapore dollars, subject to prevailing service charge, goods and services tax. 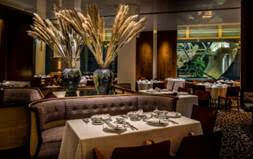 Awarded One Michelin Star for the third consecutive year, Summer Pavilion offers an authentic Cantonese dining experience with set menus handcrafted by Chinese Executive Chef, Cheung Siu Kong featuring dishes such as the braised whole South African abalone with mushroom and seasonal vegetables; and the poached rice with Dong Xing grouper fillet and quinoa in fish broth. Lunch: 11.30 a.m. to 2.30 p.m.
Christmas Day only – First Seating: 11.30 a.m. to 12.45 p.m. / Second Seating: 1.15 p.m. to 2.30 p.m.
Dinner: 6.30 p.m. to 10.30 p.m.
Keep a look out for Santa Claus and enjoy a special performance by Christmas carollers. A five-course set menu will be available at $158 per person. À la carte menus are also available. Dinner: First Seating: 6.30 p.m. to 8 p.m. / Second Seating: 8.30 p.m. to 10 p.m.
A five-course set menu will be available at $198 per person. For dining enquiries or reservations, please call 65.6434.5286, email rc.sinrz.summerpavilion@ritzcarlton.com or visitwww.summerpavilion.com.sg. Savour an indulgent festive-themed afternoon tea buffet complete with delicate pastries, finger sandwiches and Christmas desserts. 2.30 p.m. to 5 p.m.
New Year’s Eve only – 2.30 p.m. to 4.30 p.m.
Take a break from the busy year-end festivities, and check into the award-winning Ritz-Carlton Spa for a day spa retreat with your loved one. Book the exclusive Ritz-Carlton Spa Suite and enjoy a $150 privilege on any two 60-minute spa treatments. Post-treatment, indulge in a festive pastry delight and a complimentary bottle of Champagne while soaking in your private hydrotherapy bath. Valid from 1 November to 30 December 2018. A minimum booking of two 60-minute spa treatments in The Ritz-Carlton Spa Suite is required. Both treatments are to be utilised at the same time, and are not exchangeable for cash or a gift voucher. Offer is subject to availability, not valid for gift certificate purchase, and is not cumulative with other promotions. For spa enquiries or reservations, please call 65.6434.5203, or email rc.sinrz.spa@ritzcarlton.com. Book the perfect celebratory staycation with family and friends. Enjoy overnight accommodation in our spacious Deluxe Kallang or Deluxe Marina room, inclusive of breakfast and a festive welcome amenity. Room rates start from $450 per night. Valid from 9 through 27 December 2018. A minimum stay of two nights is required. Includes daily buffet breakfast at Colony. Package is subject to availability and advance reservations are required. Terms and conditions apply. For room enquiries or reservations, please call 65.6434.5111, email rc.sinrz.reservations@ritzcarlton.com, or visit http://www.ritzcarlton.com/en/hotels/singapore/offers/pure-magic. Prices listed are in Singapore dollars, subject to prevailing service charge, goods and services tax. Celebrate the traditions of Christmas and the season of giving with our gourmet takeaways that are available exclusively at Colony Bakery (Level 3), from 24 November 2018 to 2 January 2019, 10 a.m. to 10 p.m. daily. For orders and enquiries, please call 65.6434.5278, fax 65.6434.5248, email rc.sinrz.bakery@ritzcarlton.com, or visitwww.colonybakery.oddle.me.